Who Is Stormy Daniels Lawyer Michael Avenatti — And Who Is Helping Him? The high-profile attorney has become ubiquitous on TV as he takes on President Trump and his longtime lawyer Michael Cohen. Who is paying his bills? Lawyer Michael Avenatti is everywhere, pursuing his case against President Trump and his longtime attorney Michael Cohen. Avenatti says he has more ammunition he has yet to fire. Avenatti was the first person in his family to graduate from college. He put himself through school by doing opposition research for political candidates — Democrats and Republicans. This year, his legal and political paths have converged in spectacular fashion. Avenatti has turned what could have been a boring procedural fight over a nondisclosure agreement into a vehicle to attack Michael Cohen, the president's personal lawyer — and President Trump himself. "He put a series of tripwires in front of the president's lawyer and Michael Cohen literally tripped over every one of them," Turley said. In one sense, Avenatti may have been lucky, from his perspective. First, he sued on behalf of Daniels so she could escape the contract she signed pledging not to talk about the sexual relationship she says she had with Trump in 2006. Trump denies there was a sexual relationship but he has acknowledged making the $130,000 payment via Cohen. Then, as Avenatti and Daniels's lawsuit worked its way forward, the FBI raided Cohen's hotel room, office and home in New York City. Prosecutors revealed they'd been conducting a criminal investigation for months into his business dealings. That gave Avenatti not only his own lawsuit but a separate federal case as avenues by which he could go after Cohen and Trump. Outside the courthouse in New York on Wednesday, Avenatti said he's just getting started. "We've got a whole host of information that we're going to be releasing about Mr. Cohen and Mr. Trump, so they better buckle up," he vowed. Avenatti won't say how he wound up representing Daniels, but said she wasn't referred to him by anyone with a political ax to grind. NPR asked him whether he sometimes does or says things just to unsettle the president. He paused. "No, I think I do and say things to advance the interest of my client and our cause and the cases at issue," he said in a brief interview. "And to the extent that may be unsettling to the president that's not surprising because he is a party opponent in litigation." 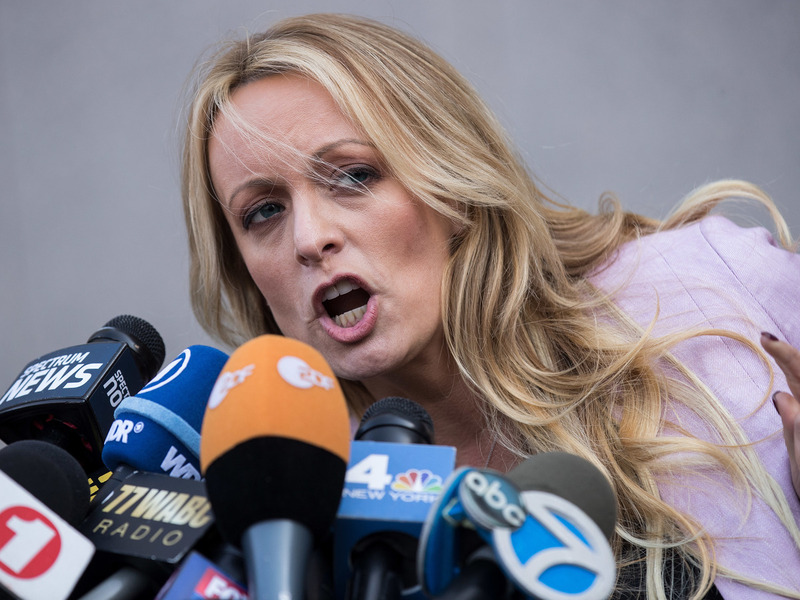 Adult film actress Stormy Daniels speaks to reporters as she exits a federal courthouse in New York City after a hearing related to Michael Cohen, President Trump's longtime personal attorney and confidante on April 16, 2018. Avenatti says the Daniels case is funded entirely through crowdsourcing — he has received $525,000, toward a target of $850,000, according to the website CrowdJustice. But money has become a touchy subject for Avenatti lately. This week, he told a judge he's a finalist for a trial lawyer of the year award — citing a jury verdict of $454 million. But in reality, the award in that case probably only will amount to a fraction of that. "It's really misleading for anyone to talk about that verdict without noting that it's been massively reduced," said Ted Boutrous, a lawyer who opposes Avenatti in the case. The verdict has been cut to $20 million, Boutrous said, and even that's now under appeal. Meanwhile, Avenatti's own financial situation has become news. 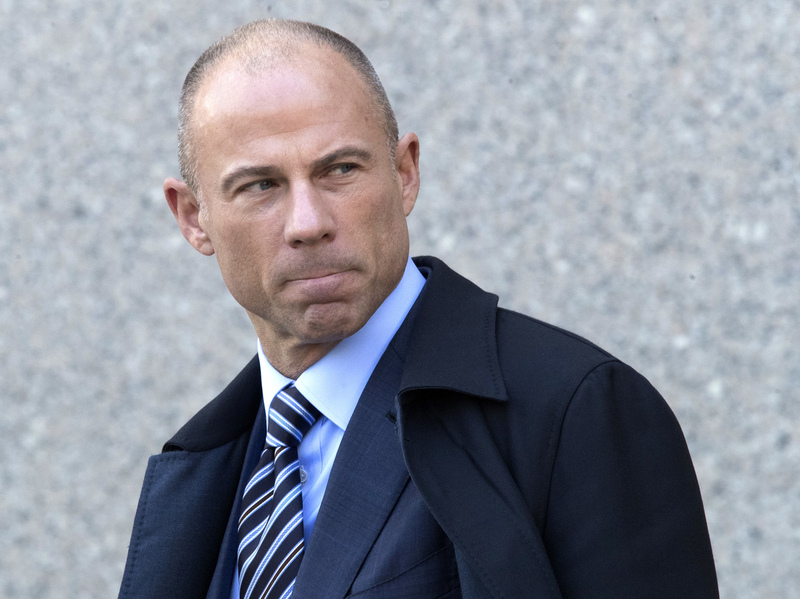 In court this month, a government lawyer said Avenatti missed a tax payment connected to the bankruptcy of his law firm, Eagan Avenatti. Avenatti told NPR that his tax situation is beside the point. "There's no question that these personal attacks are designed to undercut our case, and our message, and our efforts," he said. "There's no question that a lot of it is politically motivated. It's absurd frankly, it's malicious, it has nothing to do with the case." There are a few more questions about Avenatti in legal circles. This year, he released information about Cohen that appeared to come from a confidential government database. Attorneys for Cohen said that, for one thing, the material in Avenatti's file was partly inaccurate — it alluded to other men around the world named Michael Cohen, not their client. But the correct Cohen's attorneys also acknowledged some of the material Avenatti released was legitimate, raising questions about how he was getting non-public, confidential financial records and then putting them out in the open. The Treasury Department has launched an investigation. Lawyers usually take care not to use materials that may have been gathered illegally and, in this case, attorney-client privilege does not seem to apply, legal ethics expert Mark Foster told NPR. Eventually, Avenatti could be legally compelled to reveal his source — which would set up another public showdown with him at the center.